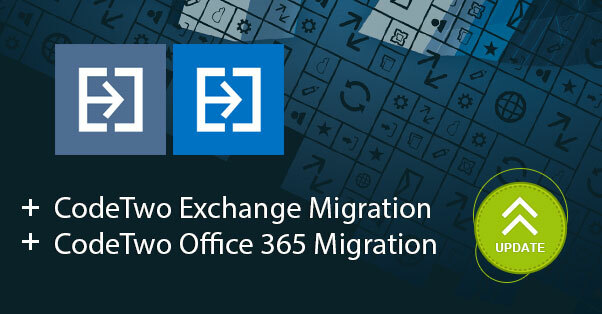 We have released a new update to our migration tools CodeTwo Exchange Migration and CodeTwo Office 365 Migration. The newest version brings two significant improvements – the Role Based Access Control model (RBAC) to manage access permissions and even faster and more stable migration. Thanks to implementing the RBAC permission model, our migration tools no longer require domain/global admin permissions when connecting to source and target servers via EWS. Now you can control, by assigning specific roles, who will be able to perform migration tasks and to what extent. In other words, you can assign specific roles to a selected admin account and give it minimum permissions to run the migration. You can also create a new account, assign it necessary roles and then use this account only for migration purposes. User management administrator/Global administrator or Mail Recipient Creation and Mail Recipients (allows creating new users and mailboxes – this permission is required only if no mailboxes exist on the target server). These roles are the minimum requirements to run the migration. To learn more about management roles used by the applications, go to the User’s manual of CodeTwo Office 365 Migration and CodeTwo Exchange Migration. We know how it is important for you to have a solid and fast migration tool on board. That is why we constantly work on improving migration speed and stability. Having this in mind, since the latest update, the migration process now runs significantly faster. If you have any questions regarding this update, do not hesitate to contact us!